If you have time to curl up with a book over the Thanksgiving holidays, A Fine Romance by Susan Branch tops my list of one of the best books I’ve read in 2016. I have let y’all know how much I love Susan Branch’s books, calendars, notecards, and art work. This book doesn’t disappoint. A Fine Romance was written first, prior to The Fairy Tale Girl and Martha’s Vineyard Isle of Dreams, but completes the story and is good to read after Martha’s Vineyard, it ties it all together. A Fine Romance ties up the loose end we were left with at the end of Martha’s Vineyard. Susan updates us on how her relationship and love of her life Joe Hall moved forward. The rest of the book, Susan takes you on their personal journey of a transatlantic sailing to England. The story takes you on their trip around England and sailing home. She writes the book in journal format, a day by day account of an amazing trip and is filled with personal stories. I promise you the book will take you right along with them. The quaint little villages where they stay in apartments so they can walk the cobblestone streets and live as a local. She shares the tiny little shops they discover and the treasures they find, the pubs they dine in and the footpaths they explore and finding hidden gems along the way. She shares English history and the amazing spots they visit, a visit to the home of Beatrix Potter, other respected authors and castles. A Fine Romance will leave you wanting to pack your bags, go and follow in their footsteps. Along the trip, you will be laughing at her little stories of watching the camera lens roll off the roof of the car as they drive away white-knuckled while driving country roads on the opposite side of what she is use to. Trying to find a place to turn around and go back, hoping the lens is unhurt. You can smell the rain, feel the culture and people as they travel. Take time to hang on each page, admiring her artwork, the tiny little drawings that complete the story and the quotes that she weaves across the pages. 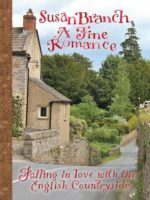 Throughout the book you will feel as though you are sitting in a little cafe in the Cotswold’s next to an old stone fireplace with a roaring fire, chatting with your best friend over an English cup of tea, scones, jam and cream. As you close the book, you will want to go right back to the first page and start again, sure that you missed a drawing, a quote, or little story. Also because you don’t want the journey to end. If you need a vacation and can’t take one, A Fine Romance will take you away. Crawl into the pages with a cup of English tea and just live on each one while exploring the exquisite English countryside without leaving your couch. If you want to check out her store and blog, follow this link. I want to wish you all a beautiful Thanksgiving wherever you may be spending it. May it be a day filled with blessings, family, friends and everyone who is special to you. What an absolutely lovely review about a simply enchanting book & writer! You captured the essence of why so many love Susan & her work. From her cookbooks & calendars to her trio of memoirs. And so much more! All so beautifully handwritten! & illustrated.Your review is sure to win even more over to Susan. Kat, thank you so much for your comment. I have loved everything Susan Branch for a long time, and the books were the icing on the cake for me. She wrote from the heart, was so open and honest, you can’t help but fall in love with her and the books. Happy Thanksgiving!